Click the “Details” button to see the Product Details page and click the “+CertID” button there. 4. Once the product is added the CMS Certification ID widget between the “CHPL Search” and “CHPL Resources” tabs on the top of the site will expand showing the product name and current status. 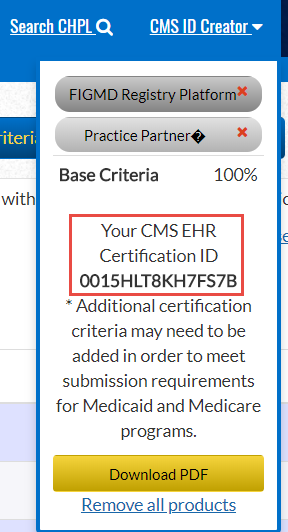 Note: you can minimize and maximize this widget by clicking the title “CNS ID Creator.” Additionally, the widget will prevent you from generating a CS HER Certification ID until enough products have been added to meet a Base EHR requirement. Practice Partner 11.1 will not allow you to create a CEHRT ID until you add an additional product. The reason is that 11.1 has to be matched with a product that has certified CQM data. 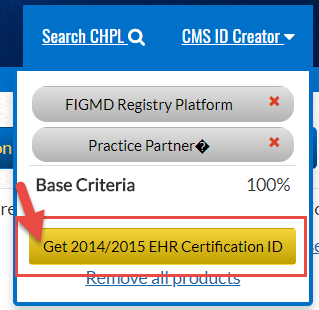 Click on the +CEHRT ID, the CMS ID Creator will open adding the additional product to the cart. 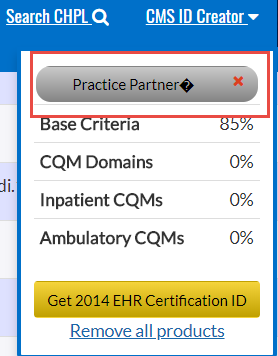 Click on Get 2014/2015 EHR Certification ID bar and it will now create a CEHRT for both products.